The legend is based on the age-old tale of a beautiful woman named Maria who drowns her children so that she can be with the man she loves, only to have him turn his back on her. In a fit of rage and despair, Maria kills herself, but is unable to enter the afterlife because she is without her children. Maria is doomed to roam the Earth for eternity, searching for her children, thus the name “La Llorona” – the “Weeping Woman”. It’s a horrific, haunting tale that makes for a perfect ghost story and one hell of a stunning maze experience. 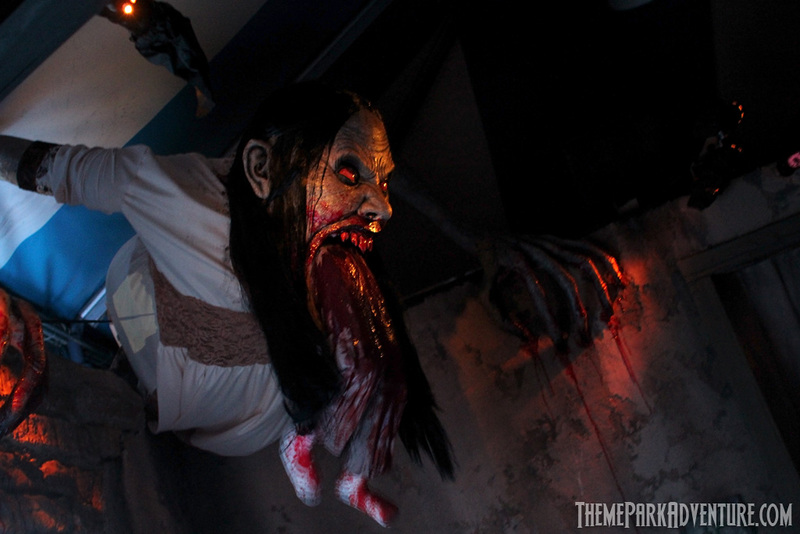 The maze itself proved so successful that it made a return this year for the 2012 run of Halloween Horror Nights. 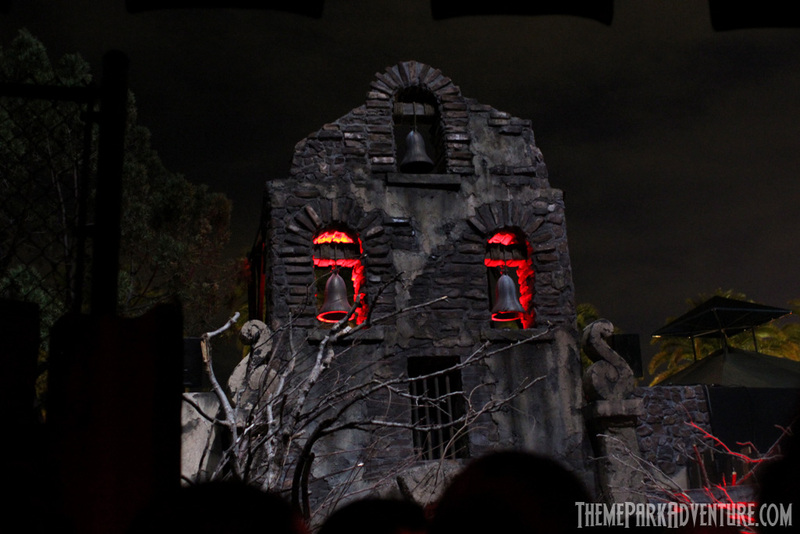 Note however, that mazes returning to HHN are usually re-imagined, which is the case with La Llorona. Chris and John added new show elements and scenes to the experience this year and turned the terror level up a few notches, while retaining the dark, heavy thematic flavor of the original. In all honesty, I was a bit concerned that the fantastic feeling of the original version would be lost this year; pushed out of the way in the name of gore or more “scare moments”. Half way through the maze, my concern subsided; Chris and John maintained the theme perfectly while infusing it with stronger horror along the way, and I applaud them for that completely. The facade and general flow of the maze remains pretty much intact from the 2011 season at HHN. The talent is more aggressive this time around, and the make-up used on the main La Llorona talent is definitely much more frightening. A few new scenes have been added, as well as very well-placed scents, creating a completely immersive and believable environment. Of note the biggest change to the maze is the addition of several large-scale props toward the end, delivering a very powerful ending that lasts for several rooms, one shocking visual bigger and better than the last, until you find yourself outside; absolutely brilliant! The signature scene however, remains the lake where the bodies of Maria’s drowned children float lifelessly on the surface of the water. Music is loud and powerful at this moment and if guests happen to be in the room at the right moment, a horrifying apparition becomes illuminated of La Llorona; the icing on the cake in this maze! For the second year in a row, we feel that La Llorona is the best maze at Universal Hollywood’s Halloween Horror Nights and give huge props to the entire crew for bringing this special maze back this year with a vengeance! Be sure to check out our behind-the-scenes video featuring a look at the make-up and costumes at Halloween Horror Nights, including La Llorona! This entry was posted in Haunted Attractions, Home Page and tagged Chris Williams, Halloween Horror Nights Hollywood, John Murdy, La Llorona, Universal Studios Hollywood. Bookmark the permalink. One of the top mazes at Horror Nights. I wouldn’t mind seeing it in 2013.